When you're first building your website, you'll spend lots of time in the Style Editor, so it's important to understand just how to use it right from the get-go. Think of your template as the structure/frame of your house, and the Style Editor as the interior decorating. The Style Editor can change the look of your fonts, buttons, navigation, footer, enable or disable parallax scrolling, the look of your announcement bar and more. The template you choose controls the layout. Some templates have a sidebar, banner images, index pages, the availability of parallax scrolling and special blog features such as author profiles and auto-populated related posts. If you template has a certain feature, say, banner images, you would enable that feature and change the styles of it (height of the banner, if there's a down arrow on the banner, change the color of the overlay color over the background photo, etc.) in the Style Editor. Not sure what template has what features? Here's 2 perfect resources to answer that exact question for you. Which Squarespace templates have ... a sidebar, index, parallax, second navigation + more! Okay, back to the Style Editor. Now you know a little bit about what the Style Editor can and cannot do, let's show you exactly how to use the thing! Want to hop to the part you're especially interested in quickly? Just getting started with your site? 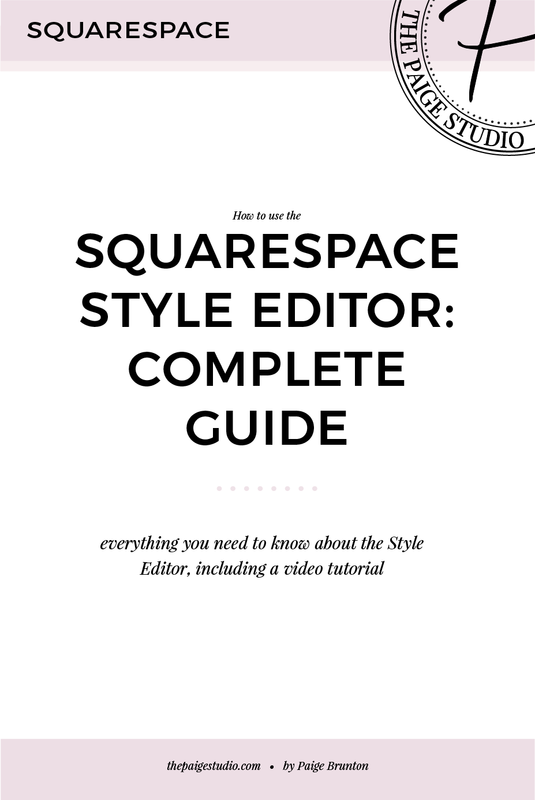 Be sure to grab a copy of the Start Your Squarespace Website Workbook which gives you a clear path on just how to get started building that fab new site! What’s the difference between WordPress & Squarespace?